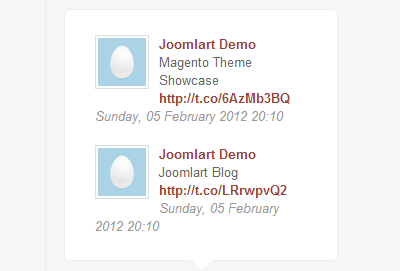 Twitter Account information can be configured to be displayed in front-page of the module or not. Limitation for number of tweets to be displayed. Twitter account Avatar can be displayed in each Tweet displayed in the module or not, in this case, you can set size for the Avatar. Twitter username can be set to be displayed above each tweet. One click to enable or disable Tweets source. Custom Text heading: enable it and type any text to be displayed as the heading of Twitter block. Encryption of OAuth information for security, so that you will never lose your OAuth information. Since 2013-06-11, Twitter has stopped supporting API v1 and fully moved to API v1.1. In API v1.1, Twitter denies non-Authorized request, that means you need to provide the information below to authorize your request. The information needs to be secured so after you save settings, the OAuth information will be encrypted. The Twitter account information displayed in front-page bases on provided screen name. The information includes: Avatar, username, location , web, etc. The Tweet displaying settings include: number of tweets to be displayed, Twitter account avatar displaying in each tweet, size of Twitter account avatar, Twitter username, tweet source and custom text heading. 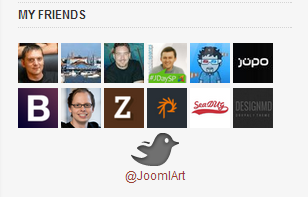 JA Twitter module allows you to display your Twitter friend list. Number of friends and their avatar size are configurable. For simple follow button type, multiple button styles are supported by default, select the one you prefer to use in your site. In you don't like button styles supported in "Simple" button type, you can use button type: "Api connet". It includes: Followers count display setting, language, width, alignment, etc.